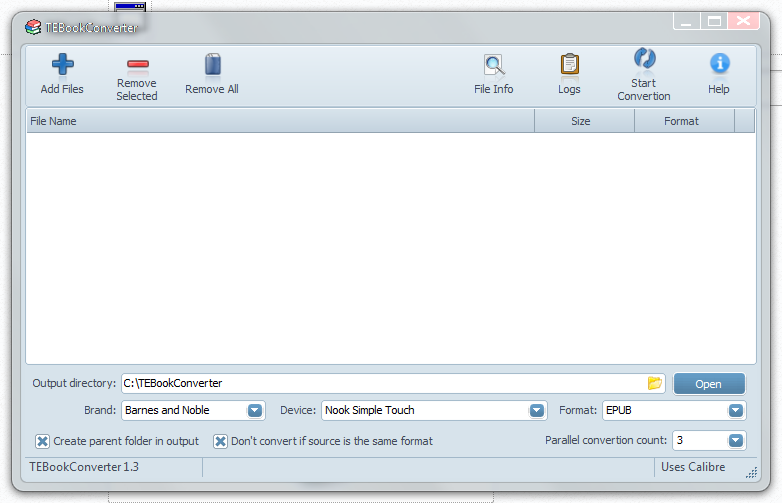 TEBookConverter is an easy to use ebook converter built using calibre. The program has simple conversion interface rather than calibre's ebook management suite and elaborate feature-set. You can convert ebooks quickly and easily using parallel processing. Presets for several devices (Kindle, Nook etc) are available. Supported input formats include cbz, cbr, cbc, chm, djvu, docx, epub, fb2, html, htmlz, lit, lrf, mobi, odt, pdf, prc, pdb, pml, rb, rtf, snb, tcr, txt, txtz. Supported output formats are azw3, epub, fb2, oeb, lit, lrf, mobi, htmlz, pdb, pml, rb, pdf, rtf, snb, tcr, txt, txtz. How to extract: Download and extract the self-extracting EXE to a folder of your choice. Launch TEBookConverter.exe. I was able to successfully convert a DOCX file to MOBI file for an Amazon Kindle device. All I really needed was the index and basic formatting preserved and that's what it did. Also images worked well. I'm very happy. Links not longer work, well not for me. But firefox had a warning "The site ahead may contain harmful programs"
ReadThemAll is a e-book reader primarily designed to be used in a hand-free mode. Although it can be used as a general purpose reader, its main benefits come from its innovative auto-scrolling: a way of reading books so you don't have to manually list pages. The program is a successor of the identically named software for PalmOS. NOTE: Site offline; linking to archive.org and softpedia. How to extract: Download the ZIP package and extract to a folder of your choice. Launch RTA.exe. Oustanding idea but how about a mode that scrolls text like a movie scrolls text? Why doesn't it have that? The text-replacing line roll thing is just odd. For every file you open, it creates a hidden .rtainfo file in the same folder. And I thought Picasa was bad.